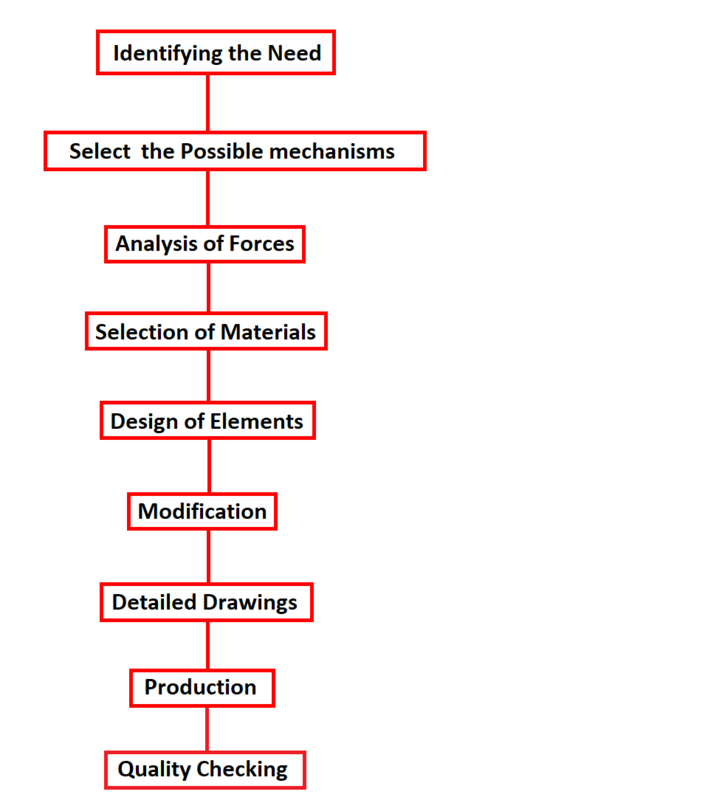 The Machine design procedure will require so many factors need to be considered. These factors we can call them as the steps or a procedure. There are several steps involved in designing a machine either it is a new machine or an existing one or it can be the development of the existing machine. Recognising the solution for a problem by giving a complete statement of the problem by identifying the aim and purpose of why the machine is needed to be designed. Analyse the different system of forces in the motion of the machine members and power transmissions among the different machine elements. Select the best-suited materials for the different components in the machine and we should keep an eye on the availability of the materials as well. We should design a machine that should accept the operation conditions as well as it should withstand for a longer life. For that, we need to analyse the size and stresses acting in different elements in the machine by considering the forces acting on the machine elements. we should check these stresses with the permissible stress of each material we have used in the making of machine elements. To reduce the overall cost of the productions and due to the availability of the resources, we should make some considerations to accommodate the changes. we should modify the size or any other modification needs to happen. this is the case we need to be ready to do modification in the design. We can say this is the final stage for determining what kind of machine we are going to build. Once we have done with the detailing of each and every components and assembly and subassemblies drawings, we should proceed with the manufacturing. As per the drawing, the components will be manufactured in the manufacturing units. and assembled as per the detailed drawings. her everything will be produced and sent them to the next step quality checking(QC). If any difference is there then it should come back for the reproduction. This is the final step to determine whether the production of each machine element is as per the detailed drawings we have provided.